Radiators use boiling water or steam, which is pushed through pipes. The heat is transferred through the radiator to warm the room. 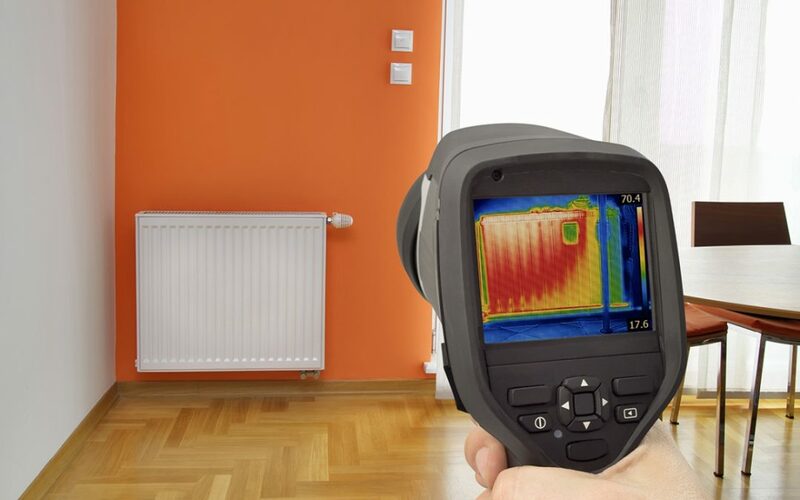 An inspector can use thermal imaging to see if the radiator is completely heating or if it is only partially warming. If the radiator is not working properly, it may be partially blocked or condensation may have accumulated in it. Should the infrared scan reveal any differences in temperature, it’s advisable to have it looked at by a heating and cooling specialist. Using an infrared camera to detect thermal energy during a home inspection is one of the only ways to evaluate floors heated with a radiant heat system. The system should provide consistent heat throughout the piping underneath the floor. An infrared image will show the same color throughout the heated floor if it is functioning well. Plumbing that is quietly leaking behind shower walls is usually not detected until there are visible signs of damage to the drywall. An infrared camera has the ability to identify changes behind the wall. Thermal imaging during a home inspection can show temperature differences behind drywall, shower tiles, and tub linings, suggesting excessive moisture and a possible leak. Checking for low or missing attic insulation is one of the most common uses for a thermal imaging camera. The attic floor and access doors can be inspected for insulation. When a homebuyer is looking at insulation, it is not always easy to spot areas where it is missing or less dense. The U.S. Department of Energy recommends maintaining insulation to keep the home energy efficient and comfortable all year long. Insulation in between studs in the wall can accidentally be overlooked during construction. Checking the walls for insulation can also detect old windows or other areas that have been built over but not properly insulated. The breaker box can have hotspots, and this could be a serious issue. Some things that the infrared camera might be able to pick up inside the panel are overloaded circuits, overheated components, or possible electric faults. An infrared inspection may pick up possible water leaks behind stucco. Attached carports and garage doors can be inspected for insulations and water tightness. Thermal imaging during a home inspection can bring to light hidden issues, which can then be addressed before they become bigger, expensive problems. The inspection often puts the buyer’s mind at ease by providing insight into components that is only revealed by using an infrared camera. Kelleher Home Inspections includes thermal imaging with all of their inspection services in the Greater Las Vegas area. Contact us to schedule an appointment.